Now we are in February this gorgeous little miniature from Brazil is in flower again. 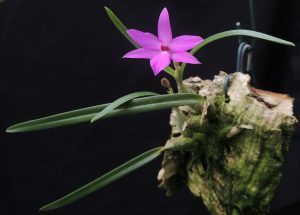 Sophronitella violacea is native to Organ Mountains in Brazil where it grows in forests around 1000m and its flowers are 2.5cm across which is really rather large for this tiny species with 2cm pseudobulbs each topped by a single leaf. 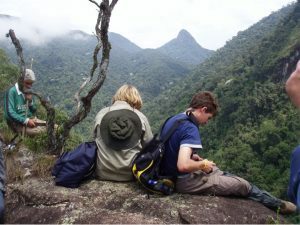 The Organ Mountains (Serra dos Órgãos) are a precipitous ancient granite mountain range near the coast in the state of Rio de Janeiro and the spot we visited during our expeditions to Brazil in 2000 and 2005 – Students on a ridge in the Organ Mountains below. The species is hummingbird pollinated and it shares many characteristics with its relative Cattleya coccinea also from the Mata Atlantica forests of Eastern Brazil. In cultivation we find it likes to grow cool and bright and wet but enjoy really free draining conditions. We grow all our plants mounted and hanging high in the greenhouse where we spray plants daily except in warm summer weather when we spray them twice a day. Flowers only last a week but are so utterly charming that we would never be without this species in our collection.